Container FCL55 has just arrived and container FCL56 is in Beira awaiting clearance and transport to Lilongwe. Once the containers leave the UK there is still much paper work to undertake and our clearing agent, Smile Namagonya, does a wonderful job in clearing the goods through customs and arranging delivery. This is not an easy task and each container has arrived safely and unopened. Recently the fuel cost in Malawi has gone up 25% and this will have an effect on delivery and shipping costs. Number FCL57EKW was loaded on the 25th June from Strachur. It is wonderful how people turn out to help with the loading and the supply of food for everyone. 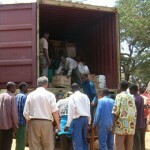 The goods being shipped represent the love and care of many people and organisations across Scotland for the people of Malawi. Some have questioned the viability of the work and the answer must be in the joy in the eyes of those who receive the goods and the letters of appreciation from the institutions being assisted.